The 23-km stretch of Lucknow Metro’s North-South Corridor will reduce travel time by 50 minutes. The ‘City of Nawabs’ is speeding up! 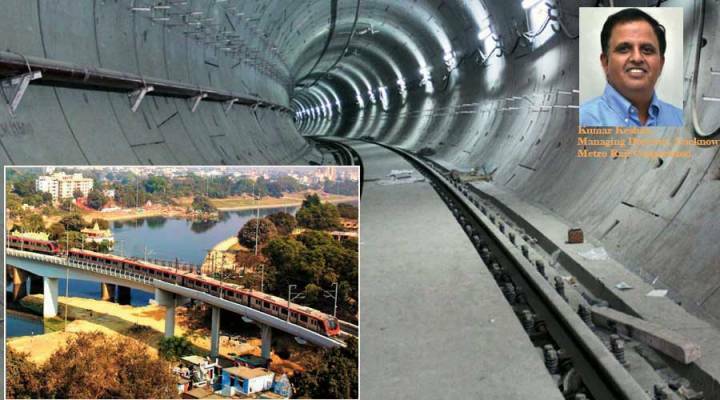 Lucknow Metro recently completed the successful load testing of the 22.878-km-long stretch from the Chowdhary Charan Singh International Airport to Munshipulia of the North-South corridor and has also started its trial run. The metro work was completed in February, ahead of the initial deadline of April 2019, and the stretch is expected to be operational in March. Currently, it takes around 90 minutes to reach Chaudhary Charan Singh Airport from Munshipulia. With this route being operational, the distance will be covered in just 40 minutes. The stretch will have 21 stations. Each metro station has four elevators and four escalators, except the Amausi and Mawaiya station, which has three elevators and escalators, and Singar Nagar, which has two. In the underground section, Sachivalya Metro Station has five escalators and four elevators and Hazaratganj has six escalators. Apart from basic amenities in place, such as air-conditioning, CCTV cameras, free Wi-Fi, drinking water and effective public information systems, LMRC has made special planning and arrangements to cater to the needs of differently abled passengers. “Lucknow Metro is also unique for its public information display system,” says Keshav with pride. For the safety of commuters, LMRC has used fire-retardant materials, fire and smoke detection and protection, the use of emergency communication facilities and CCTV cameras. Moreover, at Mawaiya railway crossing, LMRC has constructed a special balanced cantilever metro span of 255 m (central span of 105 m; end spans of 75 m each). This is one of the most challenging and critical jobs, executed at 21.5 m above ground while passing over a railway crossing at a 15.2-m height from the ground level under extremely difficult situations in the middle of the traffic-heavy main road. Also, along the same lines, Lucknow Metro has constructed a 177-m CLC span at Gomti River, which is considered to be one of the fastest completed spans over a river in India. LMRC’s metro stations and depot have been designed and built as green buildings in accordance with the standards of the Indian Green Building Council. Other initiatives undertaken, as Keshav elaborates, include regenerative braking in the trains, which will result in saving 30-35 per cent of traction energy; use of 1 per cent criteria for underground stations in the air-conditioning system; variable VVVF drives for all lifts and escalators; LED lights at all stations and in trains; energy-efficient equipment for the environmental control system and tunnel ventilation system for the underground stations; a 1-MWp capacity solar roof plant and a waste composting machine at the Transport Nagar depot. The completion cost (including central taxes) of Phase-IA of the 23-km-long North-South Corridor is Rs 68.8 billion, as per the revised DPR submitted to MoUD in October 2013. The project is being implemented on a 50:50 model with equity sharing by the Centre and the Uttar Pradesh Government. Over 50 per cent of the project is being funded through foreign debt from the European Investment Bank (EIB). Total cost: Rs.68.8 billion (Estimated completion cost for Phase-IA – 23-km-long North-South Corridor). Contracting Agencies: Larsen & Toubro. Tel: 022-6752 5656. Website: www.larsentoubro.com; Gulermak. www.gulermak.com.tr; Tata Projects. Tel: 022-6740 2900. Website: www.tataprojects.com; Systra. Tel: 0129-668 5600. Website: www.systra.in; Alstom. India’s mass rapid transport story!